Everyone Needs to Join the Discussion! 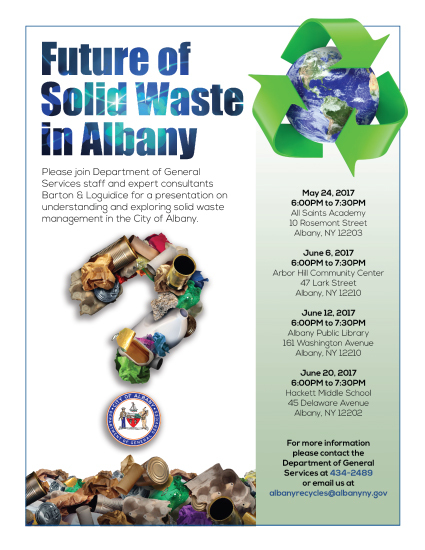 The City of Albany has announced meetings to discuss the future of solid waste in Albany. The landfill in the Pine Bush is finally scheduled to close in 2023. We need to decide what to do with our garbage. When you receive this newsletter, you should still be able to attend one of the three of the next meetings scheduled to discuss solid waste. Please attend a meeting (see notice to the left) on June 6, June 12 or June 20. Save the Pine Bush spent many volunteer hours and and a lot of resources fighting the expansions in the landfill. Now, it appears this mountain of trash in the Pine Bush will finally close. What should Albany do with its garbage? Now is the time for the City to plan to become a city that produces zero-waste. Come to a meeting and express your views!